Tis’ the season for bridal shows. For some, a bridal show experience can be an overwhelming one but for those that are prepared, it can be rewarding. 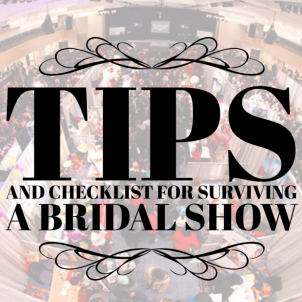 I want to share with you a checklist of things to remember as you get ready to attend an upcoming bridal show. Research the list of vendors that will be there. Look for the ones that you need. Print atleast 2 sheets of mailing labels with your contact info to enter door prizes and info cards. Include: your name, your fiance’s name, mailing address, phone number, email address, wedding date and location. Go for the gusto and add a photo of you and your fiancé so that vendors can “put a face with a name”. Pack water, a snack, and gum. Wear comfortable clothes and shoes…and ditch the big, fabulous purse. You will more than likely receive a swag bag at the show. Bring a camera or your smartphone (fully charged) to snap photos. Bring a red pen to mark on the vendor’s info that grabs your interest. Have on hand a small notebook and pen to jot down tips and ideas. Don’t forget your checkbook. You may be ready to secure a chosen vendor, especially if you receive a discount for signing on that same day. Be bridal! Wear a bride shirt, sash, or sticker so vendors will notice you right away. Have your calendar ready to that you can add dates and check them before you schedule appointments. Check the times for the fashion shows, especially if you are needing inspiration for attire. Bring a list of questions to ask. Vendors want to inform you on services that they offer. If a vendor you are interested in is talking to someone else, standby and listen…and wait if you can. They may answer a question that you may have while speaking to someone else. Go ahead and schedule appointments to meet with the vendors you really like. Place the vendors’ info that you really like in a special bag so you don’t get them mixed up with the others. If your groom is with you, stay together. It’s hard to make decisions if you both don’t have input. Don’t register for everything at the show. Go for the drawings that you would love to win. If you see a vendor that you have already hired, ask them for referrals of other services that you need. Schedule a break. Enjoy the food and music and take a moment to take in all that you have experienced. Pick up free magazines, menus, and other materials to read for later. And, don’t attend the fair alone. Bring your mom, your fiance’, or a gal pal. Are you planning to attend any local and upcoming bridal shows? If so, I hope that these tips will be helpful to you.